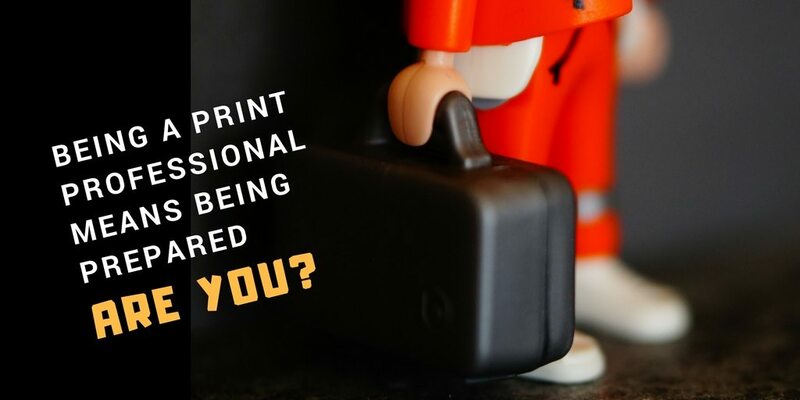 In conversations across the spectrum of the printing industry, I hear again and again that we increase our odds of success by BEING PREPARED. The right tips and tools make a difference, wherever we are in our professional career path. The truth is, you can open new doors by being the one who is ready to go when opportunities arise. Knowing how to use these tools can make or break a situation, so being prepared also means practicing ahead of time. After you read my tips, let me know what you think! Here are my 12 Success Tips and Tools to use when you need a quick solution or when you want to position yourself more professionally in your print career. 1. P.O. Box – You may use your home or business address for just about everything, but it helps to have a separate post office box, too. If you change jobs or move, a post office box can provide continuity of an address. You can rent the smallest one your post office offers. If something large arrives, they will put it in a bigger box until you can retrieve it with their handy key. If someone wants to send you something you’re not sure about, or you don’t want to give out your work or home address, you have a place it can go. I remember a very brief promotion for a free book, only while supplies lasted. Normally book promos require you to pay the shipping fee, but not this time. I jumped on it, and it turned out to be a book that actually changed how I run my business. I would not have ordered through a promotion like that and given out my home address, but I was prepared. Good thing! 2. A Gmail account – Many people hate Gmail and just refuse to get a Gmail address on principal. However, I love the Google suite of office apps, especially Google Docs and Google Sheets. You can open Word docs and Excel files with them, and everything works as it should. I like having a doc that I can share, that is always updated, and that can be embedded in other apps as a live document so I’m not fooling around with versions. In addition, if you want to work with YouTube, your Gmail account is a very easy way to create a channel and start adding videos. I remember a situation where I needed to share a large amount of info very quickly with a client. I narrated the instructions onto video, uploaded it, and was able to help them without a big hassle on either end. Any other solution would have been too technical for them. So a Gmail account, even if you don’t use it often, can be a lifesaver. 3. Calendar – Yes, I know, you’re one of those hands on people who wants to call people or email them endlessly to set up an appointment. Most of the time, texting someone works fine to get to a consensus, but some of my clients don’t text. With a shared calendar, you can set up recurring appointments, reserve times each week or month, set up reminders, and notify everyone automatically if there’s a change. Whether you share your own calendar or use an app like Calendly, you can block out chunks of time where you will accept appointments. You can define what the appointments will be and how much you charge if it’s that kind of meeting. I have client intake meetings that can take a few hours, and my clients have their V.A.s attend, so a shared calendar makes everything tidy. Even if you don’t share your own calendar, you should send calendar invitations if you are the person setting up the meeting. Oh, the last thing, choose a calendar app that integrates with your CRM and email newsletter platform, especially if you’re in print sales. 4. V.A.s – Virtual Assistants. You have one, right? If you are in growth mode, it is very handy to have an assistant who keeps you organized, is spot on with technology, checks your calendar each week, and keeps things from getting in the way. You can have a stand-up meeting on Monday morning and get your burndown chart organized. You’ll probably communicate and work inside a project management app (Trello, Asana, Basecamp, Glip, etc.). A V.A. in a time zone ahead of yours is helpful, as that person will be up and working when you start your day. Also, a V.A. will help you keep your goals in mind and remind you of your priorities if you start going astray. By the way, I know many printing salespeople who have their own V.A.s, so it’s not a luxury. It’s becoming a necessity for all kinds of professionals in the printing industry. 5. Your alarm clock – Of course we all use our phone alarms now, but you know what I mean. When I first started my home business, a colleague told me, “Never work in your pajamas. Always get up an hour before your best client, shower, and dress nicely. You never know what the day will bring.” I almost always follow this advice and a salute to those of you around the printing world who have seen me Skype in my “Casual Friday” clothes. 6. PayPal – Yes, we hate their fees. However, if you go ahead and set up your account, you will have it if you need it. I remember a conversation with a very well-known industry guru just a few months after I started my business. “Sandy, I want you to re-purpose all my evergreen content. I will pay you (a healthy) retainer. Go ahead and invoice me today for next month on PayPal, and I will pay you before I leave town next week.” Guess what? I didn’t have PayPal. If you’re in business, you should have at least three ways people can pay you in addition to a check. I have heard about creative ways to handle a transaction in a pinch, especially at trade shows and print industry events. Ask your bookkeeper, your banker, and your V.A. 7. Social media – First of all, LinkedIn. Seriously, who doesn’t have LinkedIn? If you’re somewhat regular about using it, and you fill in your profile as prompted, LinkedIn will DELIVER prospects to your doorstep. Also, your LinkedIn profile will rank on the first page of Google almost always, and you get to control the content of your profile. There is plenty of advice out there about how to set up and operate a successful LinkedIn account. If you’re struggling with this, or you’re not seeing the right activity, let me know. Your LinkedIn profile follows you when you change jobs, sell your business, graduate from college, etc. It pays to have one place people can always find you. Twitter also ranks really high in search rankings. I have been on Twitter since 2009, and I have found so many people I truly enjoy, both locally and internationally. Have an open mind, and you will find that you expand your horizons and connect with interesting people. Whatever your social media platform of choice, dig in and get to know the features. Be a good social media citizen. Remember, not everyone is a prospect! 8. Web conferencing – If you need to throw together a virtual sales meeting quickly, be prepared and get an account with Zoom, WebEx or the like. Skype works great for a small group. You may be a person who always has someone else set up the meeting. Try out some free software on your own, with a friend or two (I’ll attend your practice session if you want! ), and practice starting a meeting, recording it, muting and unmuting, and adding graphics or video. Find out what each platform offers in terms of features. For an impromptu gathering, try your project management app. There’s probably an online meeting feature. By the way, if, during a meeting, someone hands you the reins and asks you to share your computer desktop on screen, it’s nice if it looks professional. Another lesson learned! 9. Portable storage devices – I always carry a thumb drive with my recent presentations on it. I am reminded of this because, as in #5, I had my presentation on my computer desktop. I am a PC user, and when I got to the venue and plugged in, my computer began doing a Microsoft update. OMG! It went on and on. Finally, someone offered me their computer, and I grabbed my presentation out of the cloud, which took a few minutes. Now I know — and I always have a loaded thumb drive in my computer bag along with a few blank ones. Why not! 10. Power and Paper – As long as we are talking about technology…always carry an extra charged battery with cables for both Android and Apple. I have saved other presenters’ bacon by having a battery they could borrow. Carry an extra pen (with your company name and logo) and a medium-sized notepad (with cool cover art and your contact info). If someone needs to write something down, they will be grateful, and they have the gift of your branded materials. 11. Quickbooks – Accounting software can be and should be simple. People make finances so hard. I work with both large and small printing companies who can’t pull together a cash flow, a monthly income statement or an accounts receivable list without enlisting all the king’s horses and all the king’s men. Even if you’re a small business owner or a solopreneur, learn how to generate financial reports so your advisors can see what you’re starting with and then help you get you where you want to go. 12. Print, of course! – Finally, I would be remiss if I did not point out that a professional business person uses printed products strategically…with attractive business cards, a memorable brochure or interactive piece of marketing collateral, and customizable letters and thank you cards that can be mailed promptly and cheerfully. If you keep stamps and stationery in your car, you’re always ready to get the job done. Whether you’re a printing company owner, an individual trying to build a personal brand, a successful salesperson, a college student, or anyone with career aspirations, these tips and tools can help you be more successful. Remember, being a successful print professional means being prepared. Do you have tips and tools of your own? Share them below! Everything is okay, but I didn’t get the point of P.O. Box and Alarm clock here. Okay, so thats your point behind the alarm clock. Got it and thanks for extra explaination. 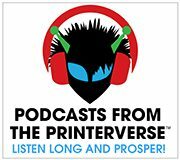 #12 Tip: Being in the print industry, we have tendencies to be “The cobbler’s children always go barefoot.” –@joelabrown. When I want to help educate my customers who are entering into an InkJet purchase decision, I don’t leave a business card. I leave-behind with a book to learn and grow. Sharing a business card can be plain boring and outdated. However, leave-behind a book of knowledge that will help them with learning and inspiration is priceless. If you would like to order/request these books that I am referencing, you can obtain them here: https://www.thinkforum.com/bookstore. Print Professionals, help your salespeople #bedifferent.